Ampthill have agreed an exciting loan arrangement with Aviva Premiership champions Saracens that will see young players contracted to Saracens Academy continue their match development under the Ampthill coaching team headed by Paul Turner. Orchestrated by Ampthill director of rugby Mark Lavery and Saracens academy manager Don Barrell, the first two players to benefit from the deal are promising young prop forwards Ralph Adams-Hale (loosehead) and Billy Walker (tighthead). Adams-Hale made two appearances off the bench for Saracens in the LV Cup last season and four for Old Albanians, including three starts in National One. Both played for the Saracens Academy side which won the Premiership Rugby/RFU U18 academy final, defeating Northampton Saints 23-19 in February. 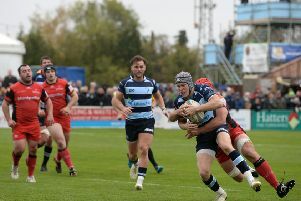 Walker made five appearances off the bench for Bishop’s Stortford in National 2 South last season, including the National 1 playoff against Ampthill where he impressed the coaching team. Lavery said: “I am delighted that Saracens agreed to loan two such promising players to Ampthill for our National One campaign. Turner added: “Ralph and Billy will both prove great additions to strengthen the Ampthill forward pack for our debut season in National One. Barrell agreed with the sentiments, adding: “Saracens are looking forward to having our young players at Ampthill. Ampthill RUFC is a Bedfordshire-based community rugby club with more than 500 members, regularly fielding more than 16 teams each week during the season drawn from its senior, youth (U19), junior (U12-U17), mini (U6-U11) and female squads.